Columbia, MD – December 7, 2017 – SolarWindow Technologies, Inc. (OTCQB: WNDW), the leading developer of transparent electricity-generating coatings for glass windows on tall towers and skyscrapers, today issued its year-end 2017 update. Of all the years that I have proudly presided over SolarWindow Technologies, this past year has been the most exciting – – and all thanks to your kind support. Because of your continued confidence, for which I am very grateful, we’ve accomplished a lot. Looking back at the many breakthroughs this year, our biggest was entering into a Process Integration and Production Agreement with Triview Glass Industries. With this agreement, we can now work towards fabricating at commercial scale and volume specific transparent SolarWindow™ electricity-generating glass products by integrating our technologies into the Triview manufacturing process. We’ve developed first-of-their-kind transparent coatings that convert ordinary windows into electricity-generating windows, which could turn entire buildings into vertical power generators. By some accounts, this is the single greatest breakthrough in the $100 billion glass industry since Alastair Pilkington developed the float glass method of production in 1952, by which 90% of all glass is made today. Our liquid electricity-generating coating technology has set records, won awards, and even been presented to members of Congress. The goal of efficiently harnessing the sun’s endless energy with electricity-generating windows has excited many of our shareholders, many in the media, and now many in industry. What started out as just an idea many years ago has become a technology that “could give our cities the ability to harvest their own energy needs,” according to CNBC. “…skyscrapers could one day soon be solar energy plants heralding a bright future thanks to energy producing windows,” reports the New York Green Advocate. According to independently-validated company modeling, electricity-generating windows could cut electricity costs by as much as 50% in commercial buildings, such as tall towers and skyscrapers. Since these buildings consume almost 40% of all the electricity produced in the U.S., which amounts to almost $150 billion in annual electricity costs, electricity-generating windows like ours that could cut this cost by up to half could be transformational for building owners. With 5.6 million buildings having upwards of 400 million square feet of existing windows in the United States alone, the potential of retrofitting these with electricity-generating windows could also be transformational for our company and our shareholders. With tens of millions of buildings around the world, the global implications of electricity-generating windows and their impact to the energy industry is mind boggling. Of course, when you’re able to significantly save on electricity, which is mostly generated by burning fossil fuels, the environmental benefits are enormous as well. More on this shortly. We began 2017 with a blockbuster announcement: the successful application of our coatings onto flexible Corning® Willow® Glass under simulated high pressure and temperature manufacturing conditions. This breakthrough could allow for the production of flexible sheets of glass which generate electricity. When applied over existing windows as a veneer, these thin flexible glass sheets could turn passive windows into electricity-generating windows. To retrofit and convert passive existing windows into an electricity-generating window, installers would cut the veneers to size on location and simply attach onto existing glass. The power generated is transferred to the edge, where the electricity is collected by our proprietary interconnection system and routed to the building’s electrical system. The entire process could be completed using a window installer and a licensed electrician. This flexible veneer could also be applied to curved surfaces, such as car, truck, and bus windows and sunroofs. Even aircraft windows could generate onboard power. Watch for this application in the future. Of our many advancements this year, the most important was proving that our electricity-generating coatings could withstand real-world, harsh environmental test conditions. Our first breakthrough came in Q2 2017, when our SolarWindow™ modules successfully passed 200 cycles of extremely high and low temperatures to simulate natural conditions. Along with successful freeze/thaw testing, we also produced favorable outcomes for glass-to-glass lamination processes, which provide enhanced security and hurricane resistance. Our SolarWindow™ module edge seals remain intact, which is vital to high performance, durability, and product lifecycle. Up until this point, however, we had only tested our transparent coatings and our SolarWindow™ modules under “simulated” conditions. We had our second breakthrough by successfully passing “real-world” autoclave manufacturing conditions. So, it was with great trepidation that I visited an actual window fabricator to put our coatings and SolarWindow™ modules into industrial-scale manufacturing equipment. 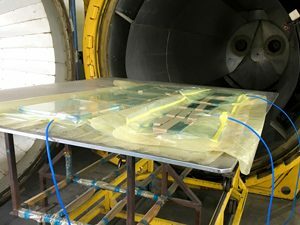 It was exciting to oversee the senior production staff as they assembled and positioned our SolarWindow™ modules inside the autoclave, closed the massive door, and initiated the pump-down cycle. Even more exciting was to witness our coated modules emerge fully intact after enduring hours of extremely high pressure and temperature inside the autoclave. This, I knew, was a defining moment for SolarWindow. This confirmed that our liquid coatings could withstand real-world autoclave conditions, a critical process required for the mass production of electricity-generating windows. Bolstered with this confidence, we quickly proceeded to the next milestone: to find manufacturing facilities to help bring SolarWindow™ products to market. Only a few months later, in late August, we entered into a Process Integration and Production Agreement with Triview Glass Industries, located just outside Los Angeles, California. “I’m proud that we are the fabricator for this innovative electricity-generating glass technology by SolarWindow,” stated Mr. Alex Kastaniuk, President, CEO of Triview Glass Industries, LLC. Existing processes at Triview are highly adaptable to the development of new manufacturing lines for SolarWindow™ products. Develop manufacturing lines for the full-scale fabrication of specific SolarWindow™ electricity-generating products. Shortly after entering into our agreement with Triview, we announced a financing to advance our manufacturing, marketing and product fabrication initiatives with four investors, three of whom have been long-term shareholders. This is what CCTV America, a division of China Central Television, the world’s largest broadcaster with a reach of more than 1.2 billion people had to say about SolarWindow. 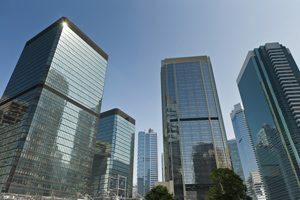 While the potential applications for our electricity-generating coatings are many, our initial customers will be commercial buildings, such as tall towers and skyscrapers. We’ve chosen this initial target market because these commercial buildings alone consume almost 40% of all the electricity in the U.S., which is mostly generated by burning fossil fuels. With electricity-generating windows installed on all four sides of a 50-story building, power and financial modeling shows these buildings could reduce electricity costs by 30%-50% with a one-year financial payback – the industry’s fastest published return. Since commercial property owners spend almost $150 billion annually on electricity, windows that could cut this cost significantly could become as critical as plumbing and HVAC systems. With the vital and compelling nature of our product in mind, our goal for 2018 and beyond is to turn every building into a vertical power generator – and save billions in electricity costs. As a businessman, the economics of savings tens of billions in energy costs are compelling. However, as a father wanting to leave our planet a better place for not only my grandchildren, but for future generations, the environmental savings of our technology is truly priceless. 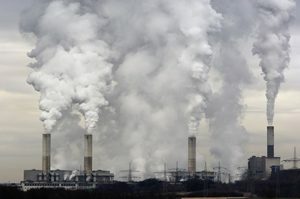 Presently, two-thirds of the electricity in the U.S. comes from burning fossil fuels, which are responsible for 99% of CO2 emissions and make us a leading contributor of global warming. I believe that the installation of electricity-generating windows could dramatically help mitigate the devastating effects that fossil fuels are inflicting on our planet. According to engineers, a single installation of our electricity-generating windows on a 50-story tower, for example, could avoid the equivalent amount of CO2 produced by 2.2 million vehicle miles each year. This single 50-story building, in fact, could provide the equivalent reductions in CO2 emissions as 770 acres of forest sequestration. With almost 6 million energy consuming commercial buildings in the U.S. and tens of millions more worldwide, the CO2 mitigation and environmental benefits of electricity-generating windows could be significant. Enough solar energy hits the earth in one single hour to power the world for an entire year. SolarWindow™ coatings can tap into this abundant source of energy and convert it to useable, renewable electricity, turning ordinary glass into electricity-generating windows. In many ways, SolarWindow today is exactly where Wilbur and Orville Wright were in 1905. While much work remained ahead, the Wright brothers did what no one in history had done before them: they mastered the complex forces of yaw, pitch and roll necessary for flight. With three-axis control, the Wright brothers could circle, bank and even make a figure-eight. Today, thanks to their efforts, the world is a much better place because of modern flight. Similarly, we have mastered several critical aspects of our innovative technology, such as coating glass under ambient conditions with electricity-generating liquid coatings. We can convert ordinary windows into electricity-generating windows that could turn entire buildings into vertical power generators. Our liquid coatings can survive harsh real-world manufacturing conditions. This brings us closer to fabricating electricity-generating windows at commercial scale and volume. To be sure, much work remains ahead for us at SolarWindow as well, but the really hard part of invention, innovation, and creation is behind us. I am confident that with your support, we will complete the remaining tasks ahead: attract additional capital, procure equipment and personnel, and implement production processes. Once done, I’ll be writing to let you know about our very own Kitty Hawk moment. So, please be sure that you are signed up to receive our latest updates at www.solarwindow.com. Finally, from all of us at SolarWindow, we wish you a peaceful holiday season and a Happy New Year! SolarWindow Technologies, Inc. creates transparent electricity-generating liquid coatings. When applied to glass or plastics, these coatings convert passive windows and other materials into electricity generators under natural, artificial, low, shaded, and even reflected light conditions. Our liquid coating technology has been presented to members of the U.S. Congress and received recognition in numerous industry publications. Our SolarWindow™ technology may generate 50-times the power of a conventional rooftop solar system and may achieve a one-year payback when installed on all four sides of a 50-story building, according to independently-validated power and financial modeling.